I finally saw my first Downy Woodpecker at my aunt’s house in Little Rock. OK, I might have seen it before but its hard to distinguish from the Hairy Woodpecker. Both are the only common woodpeckers to have vertical white strips on the back. They also have black and white wings with a comma-shaped black mark, although the mark is more obvious on the Hairy. 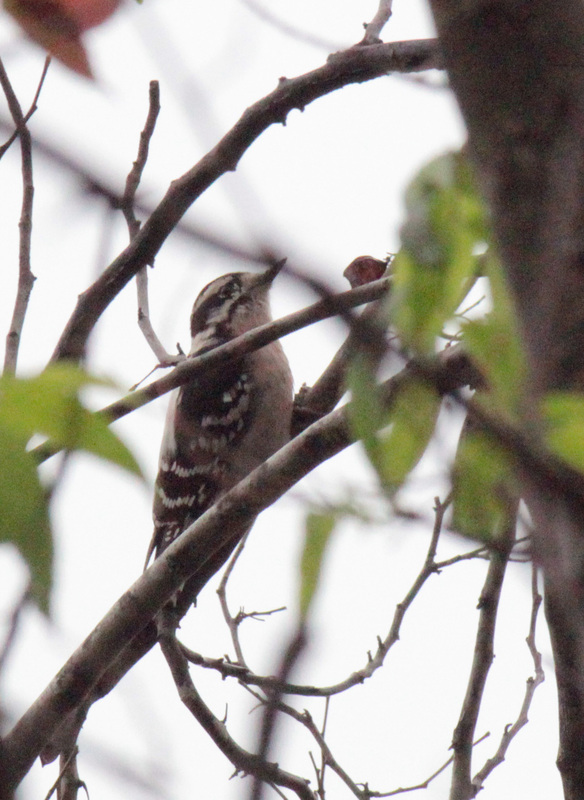 According to The Cornell Lab of Ornithology’s Project FeederWatch, the easiest way to tell which one you are looking at is by the size — the Downy has a short, about one-third long bill and is smaller at about 6.5″ long while the Hairy has a long, chisel-like bill about the size of its head and is about the size of a robin, 9-13″ long. It also helps that Downys are more likely to be found in suburban areas. The Downys have weaker, squeakier calls with a slower drum than the Hairys, which have louder, more powerful calls and a faster drum.